Over the past decade, there have been numerous studies on the amount of time children spend using computer tablets. While most studies suggest that too much time can have negative effects, one University of Alabama researcher found that computer tablets can provide a positive distraction for children facing an intense medical procedure. Dr. Sherwood Burns-Nader with the 2018 Professional Research Recognition Award. Dr. Sherwood Burns-Nader, UA assistant professor in the department of human development and family studies, was honored recently with the Association of Child Life Professionals’ 2018 Professional Research Recognition Award for directing a study that found computer tablets provide a distraction that reduces pain and anxiety in pediatric burn patients undergoing hydrotherapy. The study took place at Children’s of Alabama’s burn center. Burns-Nader collaborated with Lindsay Joe, a certified child life specialist, and Kelly Pinion, nurse educator, for the study, which involved 30 pediatric patients undergoing hydrotherapy, a painful procedure where burn areas are cleaned once a day. Since medications are often not enough for pain management, distraction techniques, such as computer tablets, have become go-to tools to help take a patient’s mind away from the procedure. According to Burns-Nader, the study showed that tablet distraction provided by a child life specialist significantly decreased observed pain and anxiety during the hydrotherapy procedure compared to a control group. In addition, the children in the tablet distraction group returned to baseline emotions after the procedure, while those in the control group displayed higher anxiety, suggesting the benefits of tablet distraction continue after the procedure. 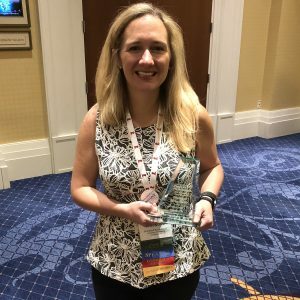 Burns-Nader was presented the research award earlier this month at the Association of Child Life Professional’s Research Discussion and Awards Presentation in Washington D.C. In addition to the award, she was recently named chair elect of the association’s Child Life Certification Commission. Burns-Nader will serve in the position for two years before transitioning to chair.